I freaking love Adventure Time. I feel like I need to begin with this, so you know that this isn’t a comic book I just picked from the shelf knowing nothing about it but one I anxiously waited to appear in Travelling Man. Adventure Time is one of my favourite cartoons, not just because it reminds me of the terrifying and hilarious shows I was brought up on (Invader Zim, Ren and Stimpy etc), but because it has an insane amount of depth to it that is frequently overlooked in shows aimed at children. I am completely unsurprised that it has become so popular with adults, especially adult geeks, as it features many influences and themes from video game and comic book cultures. The monthly Adventure Time comic from BOOM! Studios started in February 2012 and has already expanded to include a Marceline and the Scream Queens miniseries and another six-part series based on the gender-swapped reality of Adventure Time, featuring Fiona the Human and Cake the Cat. The comics have been nominated for several Eisner awards this year and as the latest edition we have the half-size graphic novel Adventure Time: Playing With Fire. Somewhere between manga and a regular weekly comic, this piece is bigger than manga but drawn black and white (although many have noted how odd it feels to read manga from glossy pages) and is frequently compared to the Scott Pilgrim series in format. The illustrations come from Zack Sterling, illustrator for the TV series, so you know it’s going to be good, and as an interesting choice of writer we get Danielle Corsetto, author/artist of the daily webcomic Girls with Slingshots, of which I am also a huge fan. So I don’t mean bad interesting; she has a childish sense of humour but an adult approach to serious subjects that works fantastically with the tone of Adventure Time, but Corsetto was brought up preferring strips to books and has traditionally worked within the tight confines of a few panels. Flame Princess, the star of Playing With Fire, is a relatively recent addition to the Adventure Time cast and is seldom seen without Finn. Until Jake’s arrival in the Fire Kingdom, she had been kept in a giant lantern on the advice of Princess Bubblegum and has since fought a battle to reign in her fiery (sorry) side and learn to be good, no matter what her father expects of her. Corsetto describes her as impatient and destructive, but a sweetheart really, and this comic is her first proper outing. Flame Princess is one of the more conflicted characters of Adventure Time, constantly torn between her father’s wishes and what she wants, and her childish innocence makes it seems that her violence is just a defense mechanism. She’s made of fire and has its destructive powers, but is determined to be what she wants to be, not just the evil Fire Elemental her father, Flame King, wants her to be. In the TV series he has been seen subliminally whispering the word “evil” into her ear when he thinks no one else is around, and in an attempt to escape him and the destiny he has laid out for her she has developed an unlikely relationship with Finn – unlikely not just because she burns his skin, but because his tears hurt her and she considers him a Water Elemental. There are some fantastic moments of character progression in Playing With Fire: Finn shows his caring, adult side when he defends FP’s irrationality and his teenage-boy side when he blushes over being called her boyfriend, although Finn’s soul is stolen shortly after, leaving Flame Princess and Jake with a miniature apathetic Finn. Jake takes rather a back seat, and that’s okay – this is about FP’s journey to become her own kind of hero, starting with rescuing her boyfriend from a series of puzzle dungeons. Deep within the caves, Jake tries to help but ends up mocking her aversion to water with his usual flippancy. With rebellious fury she goes against what Jake tells her and seriously hurts herself in her own stubbornness. When she wakes up in the Fire Kingdom, her father gives her the Lion King “this is all yours…” speech for dramatic effect, telling her to embrace her evil side, before going on a rampage of popcorn and fire. Not knowing before that she could will herself anywhere, she wishes to get away, and finds herself back in the dungeons, headed toward the soul room. She tries to melt Finn out of his terrifying alien soul pod, but it doesn’t work – in frustration she cries, hurting herself as she does, and confesses that she thinks she loves Finn. The dragon who kidnapped him lets them free now that he has experienced real love, and Flame Princess works on cooling her skin so she is able to kiss Finn without burning him – something that is both clever and a good solution to potential logistical problems between the couple. Things seem to be looking up a bit now that they have both admitted to their feelings, but it’s obvious that FP’s destiny will continue to haunt her; she’s still unsure she has what it takes to be a hero, and the book ends with a dream in which she turns into her father. Well actually, the book ends with a delightful dialogue-free classic B-mo adventure about the house. This comic had all of the mad greatness of Adventure Time with cute artwork details (including a cameo of the Snail! ), some character development which would be near-impossible to put into the children’s TV show, and a series of puzzle dungeons that would have been great on The Crystal Maze, although the main draw has to be the compelling characters that work perfectly in the Adventure Time world. 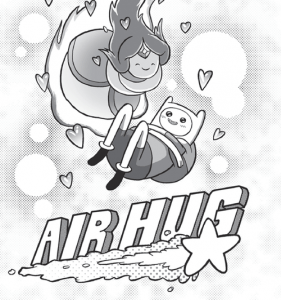 Luckily for us, Danielle Corsetto is also writing the second volume, which comes out in September 2013, so hopefully this will pan out to be THE Adventure Time comic for those – like me – who are probably far too invested in the show.